You are here: Home > Blog > Paperless meetings - which solution? Most organisations nowadays, even those still using paper, find it easy to recognise the potential efficiency gains of using online technology for business meetings. 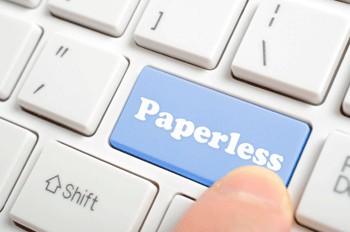 But determining the best paperless solution is a lot harder. This article assesses the merits of the most common solutions for organising and participating in meetings using online technology. Email is quick, easy and already there at your workplace. So you can understand why it tends to be the first thing meeting organisers look toward for a paperless solution. It's quite easy to formulate a mailing list of your board members and each month send them the meeting papers before each meeting. When an email is sent, its content (text and attachments) is kept on the sending and receiving mail servers and sometimes the relay servers in between as well. You have little or no control over what the IT staff, with access to these servers, does with this content. Further, you have no control over the archiving or deleting of these documents; they can potentially live forever on servers outside of your control. Most email users tend to be lazy with their security practices around email user accounts; weak passwords used on other services, user account details left on unsecure documents (eg an Excel spreadsheet on your PC) and passwords remembered via browser cookies. Using email to distribute and discuss meeting papers encourages further unsecure practices such as downloading files onto multiple devices, which may unsecure, and forwarding emails on to 3rd parties. In a perfect world, meeting papers are produced and sent once, there are no changes and everyone gets the papers first time and doesn't lose them. But in the real world this rarely happens. Each time a meeting paper is either updated or added, another round of email distribution to board members is required. With email being a flooded medium nowadays, and most people not bothering to sort their mail into subfolders, it won't take long for a board member to lose or miss an email update, requiring further sending of papers. There's no secure or easy solution for board members to collaborate and discuss meeting issues. Running group discussions via email and keeping track of changes to meeting papers is difficult and inefficient. This is because there is no central place where everyone can easily see the latest versions, changes and comments on meeting papers. Instead, you are relying on board members to keep track of long and complex email threads. You could use an email list service, but that on it's own won't give you the organisation of content (that matches your meeting structure and workflow) you need to easily access meeting papers, the collaboration tools you need to progress issues and work up content, and the security you need for handling confidential information. The end result here is that both the meeting organiser and board members end up in a frustrating mess with little or no security...each month. There are secure email solutions available but all the other problems described above with email remain. Plus the jury is still out on just how secure is secure email. “There is no way to do encrypted e-mail where the content is protected,” said Phil Zimmermann after he closed Silent Circle’s secure email service. The owner of secure email service Lavabit, Ladar Levision stated; “If you knew what I know about email, you might not use it either,” after he shut down the service. Hardly a ringing endorsement for secure email. There are eReader applications, like iAnnotate, that enable you to view, markup and share PDF documents across tablets and mobiles. This is better than unsecured email but most of these apps in their standard form don't offer any security or any way to easily organise and distribute your content that matches the way you run your meetings. So it's not a total solution. While you can use these apps to share documents with others (a security risk in itself), there's no guarantee that each of your fellow board members will have the same set-up and same set of documents that you have, because these apps do not usually have centralised control of content for a restricted set of users, like a board. Instead, they are just single instances of the app for each user. This means extra work in processing and collaborating on documents for board members. Getting documents into and out of these apps from different platforms, whilst technically possible, represents more work for meeting administrators and more difficulty for board members. A further limitation here is that they are apps themselves. Mobile and tablet apps assume you are happy to do all your work on a mobile device. This doesn't match reality. Most executives do their work across a variety of devices; mobile, tablet, laptop and PC's. With these apps, there is usually no website equivalent you can access via a browser. So in these cases, when you need to continue your meeting work on a PC you are either stranded or have to go through a tedious and time-consuming export/import routine. Cloud file sharing services, like Dropbox, provide an good way to distribute documents online and most of these services are secure. But organising and participating in meetings is not just about distributing papers. It's also about reviewing, discussing and furthering issues and papers in accordance with your meeting structures and procedures. It is possible to structure content on a cloud file sharing service to match your meeting agendas, but these services either don't have any solutions for collaborating on documents (with automated notifications on content changes) or require a degree of technical set-up to customise the service to achieve this functionality. Plus extra services such as online voting or meeting scheduling either don't exist or are not easily achieved. Whilst you can do a lot of this with a service like Google Drive, most meeting organisers either don't have the technical expertise or time to configure the service to do everything you would like it to do. "When you upload, submit, store, send or receive content to or through our Services, you give Google (and those we work with) a worldwide license to use, host, store, reproduce, modify, create derivative works..."
Enterprise Content Management (ECM) systems, like Sharepoint, are technically capable of providing most of the functionality you may need to organise and participate in meetings without paper. But as these are expensive products designed to meet every possible need for the management of an organisation's content, rather than a specific purpose, they either will not provide the solution you need "out of the box" or you have to pay extra for a dedicated module. So you end up having to spend vast amounts of technical effort to configure and support the system to meet your requirements or money to purchase the extra module. The usability of these systems can be quite low. Sharepoint has been criticised as hard to use for non-technical people. Access to these internal systems may not always be easy (eg establishing a Virtual Private Network connection) and can be problematic for board members who may not be that technically savvy. Are more secure and efficient than email. Provide you with more functionality and easier PC access than eReader applications like iAnnotate. Require far less technical effort than trying to extend or customise a cloud file sharing service like Dropbox. Don't require you to sign your content rights away like Google Drive. Are less expensive, easier to use than an Enterprise Content Management system like Sharepoint. Mark McGrath is a web consultant for Social Change Media, the owner of Sympose, an online solution for paperless meetings.